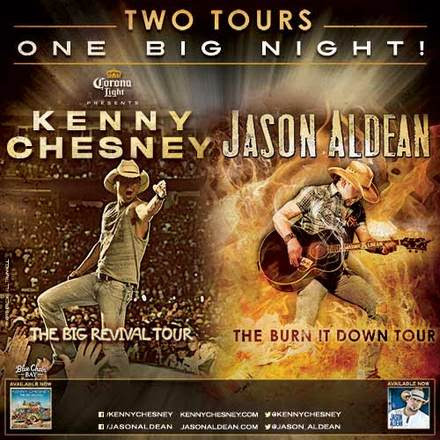 Kenny Chesney and Jason Aldean join their two hot tours together for a special ten night stadium run! The forecast for summer 2015 just got a little bit hotter as we find out heavy headliners Kenny Chesney and Jason Aldean are teaming up for TEN stadium shows together! The Burn It Down Tour and The Big Revival Tour presented by Corona Light, will meet up for 10 stadium shows next summer. The first shows to go on sale for the unprecedented pairing are New England’s Gillette Stadium on Aug. 28, 2015 and San Francisco’s Levi’s Stadium on May 2, 2015. More on-sale information and special guests will be revealed over the coming weeks. Country Music News Blog participates in advertising programs that help fund the operation of this site. For more information please visit our privacy statement. This entry was posted in Kenny Chesney, News by Country Music News. Bookmark the permalink.